Trio of ads showcasing Georgia-Pacific’s environmentally friendly products. EASY to load, easy to use, easy on the eye. thickness, reducing usage and waste. Napkins are EPA-compliant and 100% RECYCLED. Available in decorator colors. Like Green. 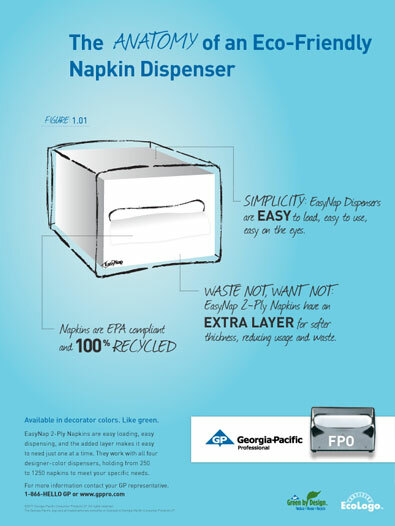 EasyNap 2-Ply Napkins are easy loading, easy dispensing, and the added layer makes it easy to need just one at a time. They work with all four designer-color dispensers, holding from 250 to 1250 napkins to meet your specific needs.